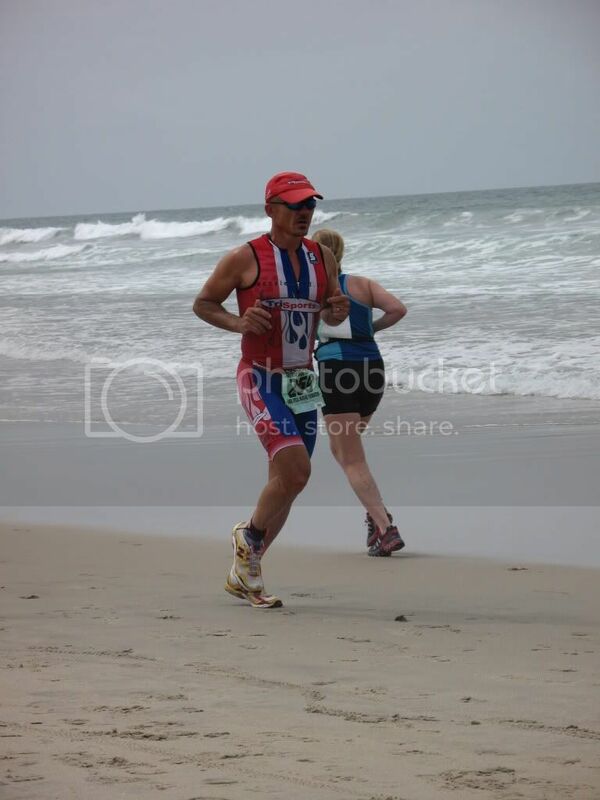 …Deuceman half ironman at the Deuces Wild Triathlon Festival in Show Low, Arizona! 6500ft. elevation, hills and if it is like last year….95 degrees! Can’t wait. After a week of no training (was able to get 2 runs in while there) while I was in Moab, I awoke having no idea how the race would go. The 4am alarm startled me awake. Ate a quick breakfast and then I was off to the University of Arizona’s Hillibrand pool , the venue for the race. 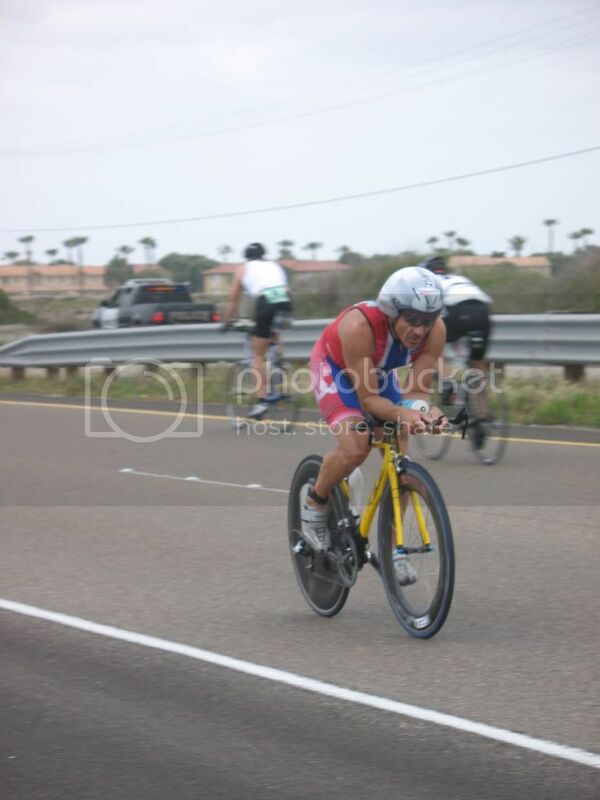 The race consisted of a 825 yard swim, 12 mile bike, and a 3 mile run. After arriving, I set up my transition area and then headed back to my car to take an hour and a half nap since I was in the 10th wave (the fast men) which would start in 4 hours later. After I woke from my nap I sat and watched some of the early waves then got in a short warmup…a mile and a half run and 300 yards of swimming. After not swimming for a week I felt sluggish in the pool. It was now time for my wave to start. I found my lane and jumped in….1 minute ’til start. The start horn went off and we were on our way. The swim felt sluggish still. I watched as the competition on both sides of me lapped me, not once, not twice, but three times. In my mind I felt I was swimming what would be a slow swim by my normal standards. I was in for a sweet surprise when I exited the pool and looked at my watch….one of my best swims! 11:33, good enough for the 25th best swim on the day. My transition went smooth…tossed the goggles, strapped my helmet on, grabbed my bike and ran for the mount line. As I hit the mount line I conducted a near perfect flying mount and was on my way. I slipped my feet into my shoes and fastened the straps…ready to rock! The Tucson heat was starting to rise as was the wind. 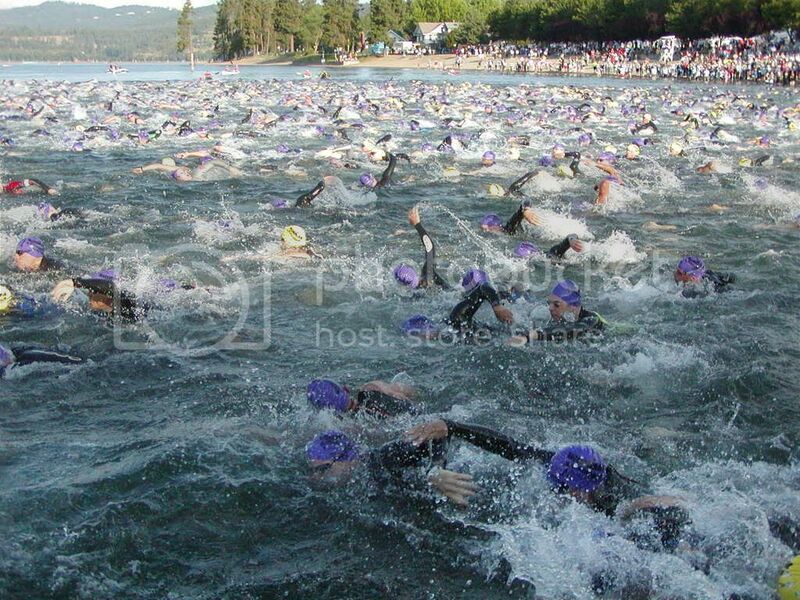 I immediately began to pick off a few of the faster swimmers. The bike consisted of a 3 lap course…each lap had a slight down hill, a pothole filled slight uphill, a false flat and then a slight downhill. The downhills I was cruising at 30+ mph, the uphills around 22mph. I had to weave my way through lapped traffic from earlier waves. As I came down the final downhill stretch to transition I slipped my feet out of my shoes in preperation for transition number 2. I rounded the final corner and as I hit the dismount line I threw my leg over the bike and jumped off running. I hung my bike on the rack and removed my helmet. I then slipped on my screaming yellow Fastwitch running shoes, grabbed my hat, sunglasses and number belt and headed out for the run. Total time for T1, bike and T2…30:03, 1oth fastest on the day. As I ran out of transition I put on my number belt, hat and sunglasses. I quickly settled in to a solid pace. Legs and lungs were screaming but I felt smooth and focused on maintaining my form. As I hit the UofA mall I began to pick off a few more of the faster guys and also lapped traffic from earlier waves. The sun was bright and it was warming up. I saw the lead men running the other way about 5 minutes up on me. I was feeling smooth and the pace was hard. I focused on maintaining my pace to the end. On the second lap I again saw the leaders and they hadn’t gained much time on me…I was holding strong and continued to pick off/lap others. I rounded the final corner and headed for the finish. I heard the announcer call my name, hit the line and was spent! 3 miles…19:20…11th fastest on the day. Overall time…1:00:57, narrowly missing the magic hour mark (next time!) but one of my fastest times on this course! I finished 12th overall and 1st in the 45-49 agegroup, 11 minutes faster than the 2nd place person in my agegroup! Just returned from a week of camping and offroading in Moab, Utah. This was my 5th trip there and I am still amazed by the beauty. The weather was nice and sunny the first 2 days. The rest of the week we were greated by cool temps , wind and scattered rain…but that didn’t stop us. With a mix of Isuzu’s and a jeep or two we hit the trails. Day 1 a few that arrived early hit the Dome Plateau trail. Day 2 we started the Cliffhanger trail but we didn’t get far before 2 in our group suffered carnage…both radiators. Day 3 a group of 25 vehicles hit the 7 mile rim trail. The day started off under rainy skies but cleared up nicely. 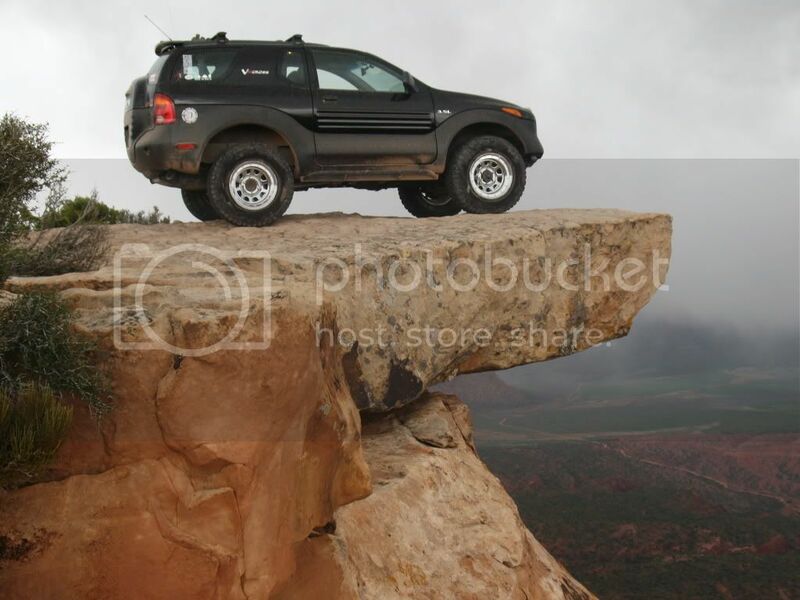 On day 4 our group headed out to the Hells Revenge under rain drops making the slickrock…..well, slick! We followed that up with a few of us making a quick trip to Baby Lions Back. On my final day we we ran through Steelbender once again greeted by liquid sunshine. The next morning I packed up and then ate my customary banana walnut pancakes at the local pancake house. Then made the drive south back home. The VX is loaded up and in the morning I am off to Moab for a week of camping, relaxing and 4 wheeling! Of course, I will still need to get a few runs in while there!